Topaz Lake in the Eastern Sierra region, on Highway 395 about an hour south of Reno, Nevada and an hour north of Mono Lake. To make this composite image I blackened the background behind several meteors in Adobe Lightroom, saved one full image, then merged them all in the free StarStaX software. Although the meteors were essentially "time shifted" into a single result, nothing was added or subtracted from the scene, or moved. The meteors appear in the final image exactly where they appeared in the sky as they fell over this landscape on that night. 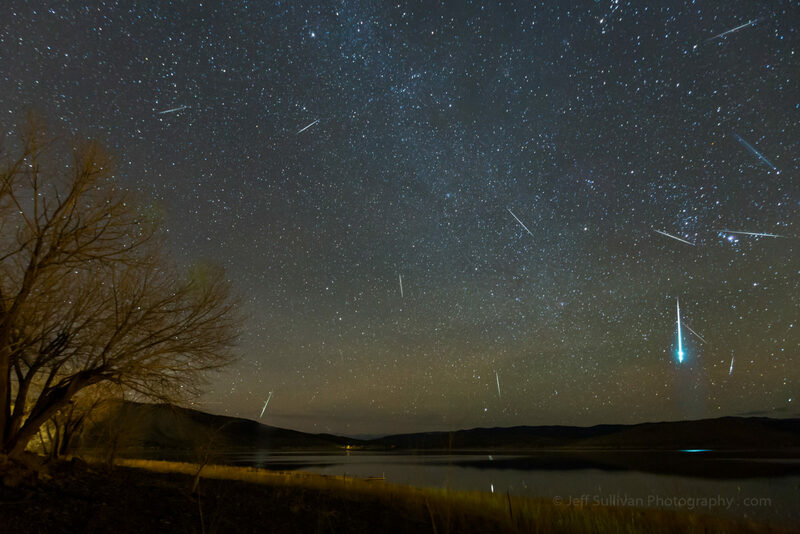 This composite image shows a few of the meteors from the 2014 Geminid meteor shower, captured in front of the house I was renting on the shore of Topaz Lake on the California-Nevada border.